The Black and Decker Dustbuster CHV1510 is a cordless, handheld vacuum that weights just under three and a half pounds. It overall is a good tool with good value for the price, and has great suction power for a handheld vacuum. 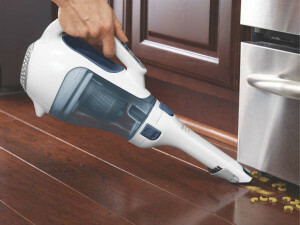 This dustbuster also comes with useful on-board attachments, including a crevice tool and brush. We found these tools very handy for cleaning inside automobiles. The largest drawback we found was that using the dustbuster for a prolonged period of time can out strain on the wrist because of the machine's back heavy design. The Black and Decker Dustbuster CHV1510 handheld claims to have seventy percent more suction than the original Dustbuster vacuum. While we were not able to compare the old versus the new, we were impressed by the new Dustbuster’s suction strength. We found that this machine did a great job cleaning our carpet and hard surface flooring. It also worked well on pet-hair and in automobiles. However it presents the drawback of having a narrow nozzle, making cleaning large surface areas laborious. Testing the machine on fine particles using flour, we found it did a great job extracting all visible particles from our carpet. We used rice to see how it performed on medium particles and found that it did a great job cleaning those too. Lastly, we tested the machine’s performance on large particles and were pleased to see that it sucked them up into the dirt cup with no problem. We did find that using the Black and Decker Dustbuster CHV1510 vacuum on carpet presented one difficulty. Instead of having a smooth movement with the normal back and forth cleaning motion, the nozzle tended to get bogged down in the carpet when pushing it forward. This machine’s suction power was evident on our hard surface floors as we ran the machine through our standard VacuumWizard tests. We began our test by spreading flour on our hard surface flooring to test the vacuum’s performance on small particles. It did a good job cleaning up the flour. Next we tested the machine on medium particles by using rice, and large particles using white beans. It did a nice job of cleaning up the medium and large particles too. The Black & Decker CHV1510 handheld vacuum worked well on the contours of our vehicle. The long nozzle came in especially helpful for getting in the cracks and crevices. The suction was sufficient for cleaning up most of the particles from our floor mats and seats. We were skeptical to see how the Dustbuster would perform on cleaning pet-hair from our upholstery because it lacks a brushroll. However, we were pleased to find that it sucked up all of our fine pet-hair from our couch. The only draw back is that the nozzle width is narrow so, as we found with other tasks, it would be tedious to clean large surface areas. The Black & Decker Dustbuster CHV1510 vacuum cleaner has a washable cloth filter and plastic pre-filter. The dustbowl and the filters can both be washed in warm, soapy water and must be allowed to dry thoroughly before replacing them and using the vacuum. We really liked that everything could be so easily disassembled and cleaned. The cleanliness of the filtration effects the performance of the machine. We tested the machine’s filtration system by measuring the particles being emitted from the exhaust with our particle scanner. We found that the count on our particle scanner decreased as the machine cleaned. This means that the filter was retaining particles and allergens within 0.03 microns per square foot. With an attached extendable crevice tool and flip-up brush, the Black & Decker Dustbuster has everything you need to clean accessible at all times. One of the things we loved about the crevice tool was how long it is. However, the crevice tool sometimes snapped out of place while we cleaned especially tight spaces like between our car seats. 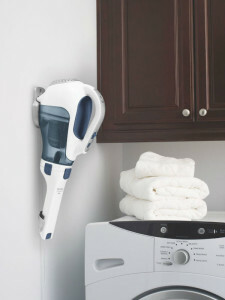 The brush flips up from the bottom of the nozzle and stays in place well during cleaning. The bristles are stiff and don’t work well for dusting furnishings. Similar in shape to a bulb with a round base and slender top, the Dustbuster CHV1510 vacuum is a little back heavy causing strain on the wrist with prolonged use. The nozzle rotates from side to side to allow you to change the angle of your cleaning without having to adjust your wrist. We didn’t find this feature useful. It only takes a few seconds to rotate the nozzle, but it is easier to just rotate the entire machine to get the angle you desire. The Black and Decker Dustbuster CHV1510 vacuum comes fully assembled, but you can’t begin using it right away. It requires that you charge it for twenty-four hours before your first use. The machine also comes with a wall mount bracket and the hardware needed to install it. You will need a drill or screwdriver to install the wall mount. At an average of eighty-two and a half decibels, the Black & Decker CHV1510 Dustbuster falls into our moderately loud noise category. Even though it is loud enough to wake a baby, it is not ear-piercing but comfortable to use. While the light weight of this machine and its cordless feature made it especially easy to maneuver on our stairs, we found that the narrow width of the nozzle made cleaning larger surface areas like stairs laborious. The extension nozzle was great for getting in the cracks. Black and Decker provides a wall mount bracket to store the machine. We appreciated the option to hang this machine up and because all the attachments are on-board, it keeps things clutter free. We suggest hanging it near an outlet so you can charge it while it is stored. 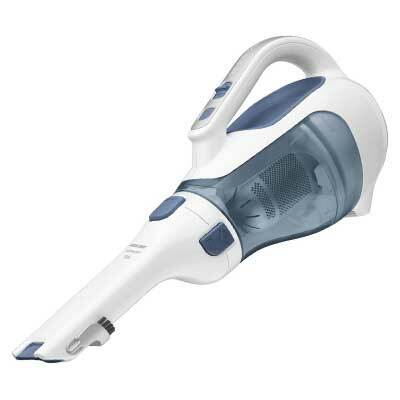 The Black & Decker Dustbuster CHV1510 vacuum cleaner is relativity low maintenance. The nozzle of the machine twists off to expose the dust bowl allowing you to easily empty it. If you want to do a more thorough cleaning of the dust bowl it can be accessed by removing the entire dust bowl from the machine and removing the filter from it. This will expose the entire cup and even allow you to wash it out with warm soapy water if desired. No other maintenance is required. We liked it. Such features as having all the attachments on-board, the provided wall mount, and the ability thoroughly clean the dust bowl makes it stand apart from the crowd. As we recommend prior to purchasing any vacuum, carefully consider your cleaning needs and determine if this vacuums strengths will meet those. If you want a machine for quick pick-ups around your home, the Black & Decker CHV1510 Dustbuster hand vacuum will work well for you. For larger cleaning jobs or surface areas, this handheld vacuum cleaner would not be a good option.